This is the handheld version of the new D1 technology, and it features the highly lauded Sennheiser e 835 microphone capsule. The e 835 is a cardiod capsule with good feedback rejection (even on loud stages), as well a broad frequency response and clear, great-sounding vocal reproduction. 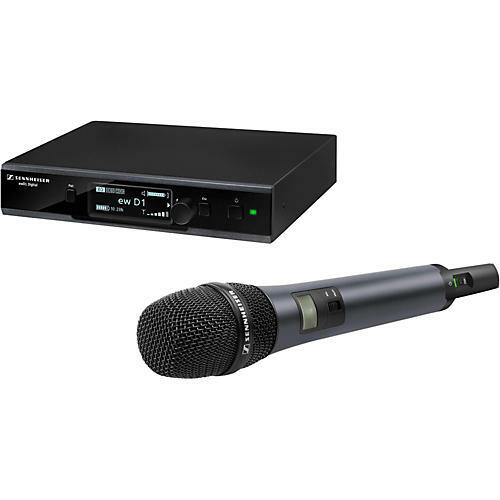 Sennheiser has long been at the forefront of wireless microphone technology, and the new D1 series wireless systems establish them as a world leader in professional wireless design and manufacturing. Digital wireless microphones are a relatively new technology, and with the D1, Sennheiser cements its high standing in the digital wireless world. The D1 incorporates five separate RF technologies that work in conjunction with one another to provide a robust, secure signal. No dropouts combined with great sound. This next-generation technology comes in a stage-proof metal housing; additional audio effects like megaphone, phone, de-esser and a 7-band graphic equalizer are also available. Additionally, the D1 grows with your needs: you can use up to 15 channels simultaneously via channel boosting, given optimal conditions. The last thing you need is a power failure, so the transmitter and receiver permanently display the remaining battery life. Transmitter and receiver are linked automatically at the push of a button, and the system intelligently adapts itself to your style and adjusts the sensitivity.